Minnie Winnie 26A Class C Motorhomes: Save Thousands! Right now, you can save thousands on the Winnebago Minnie Winnie 26A Class C motorhomes for sale at Bullyan RV! Priced at only $77,995, you can save over $22,000 to bring this triple slide motorhome, home with you today! 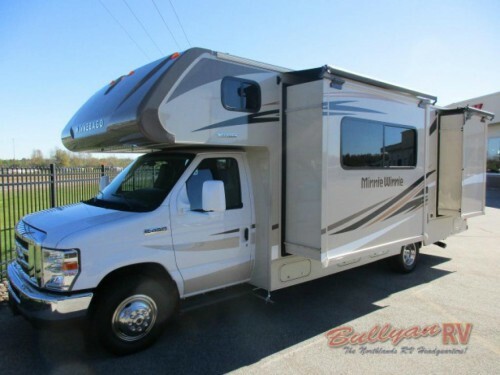 Save thousands on our Winnebago Minnie Winnie 26A Class C Motorhomes! The best thing about these sale prices is that you will still get the same great RV for a much lower price. Inside these marked down Minnie Winnie motorhomes will be all of the amenities that have set the Winnebago brand apart for years. Let’s check out just a few of these features! The Minnie Winnie 26A motorhome comes with enough space to sleep up to six people. With a queen sized master bed, convertible U-shaped dinette in the main area, and a over cab bunk, everyone will have a comfortable place to sleep after days full of fun at the campground. Between the main living area and the bed and bathroom located at the rear, you will find a full sliding door to create a little separation. This will provide that added layer of privacy to make your feel more at home. Sliding doors create separation between each area for added privacy. 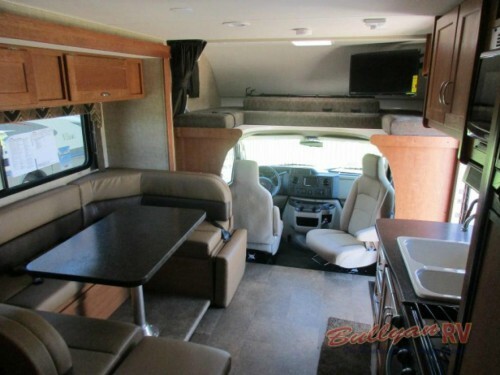 In each area of this Winnebago Class C motorhome, there will be lots of places for you to pack away your belongings. From overhead cabinets and pantry in the kitchen to the slideout wardrobe, shirt closet, and more in the master, finding the perfect storage spots to keep your RV neat and organized will be a breeze. There are so many things to love in our Winnebago Minnie Winnie 26A Class C motorhomes, but you are certain to love the price the most! 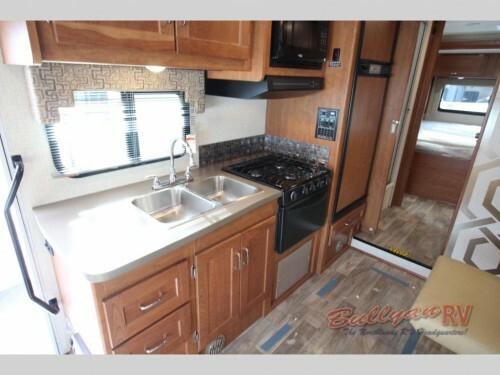 Contact us today to discover more features that come with this amazing RV, and then, come to our location to see for yourself everything you will get for an unbelieveable price!